1st Marine Battalion raising the United States flag at Guantánamo Bay on June 10, 1898. Following the explosion of the battleship USS Maine in Havana harbor in February 1898, the U.S. declared war on Spain in support of the Cuban insurgents. Havana harbor was blockaded, and by the end of May the Spanish fleet was bottled up in Santiago Bay, 40 mi (35 nmi; 64 km) west of Guantánamo Bay, by Rear Admiral William T. Sampson. In the U.S., an army expeditionary force was rapidly being readied at the same time for action in Cuba. Thus, America was allied with the Cuban insurgents. Guantánamo Bay had a measure of commercial importance because of the sugar port of Caimanera on the western shore of the inner bay, some five statute miles (8 km) from the sea. Despite the nominal offensive position of the insurgents in the vicinity of Guantánamo Bay, Spanish regulars and guerrillas held Guantánamo City, the port of Caimanera and the railroad connecting the two cities, the large sugar mills, and other outlying strong points. The Guantánamo garrison consisted of some 5,000 men under the command of General Felix Pareja. A Spanish blockhouse stood on the hill overlooking the village on Fisherman's Point near the entrance to the bay, and a fort on Cayo del Toro commanded the relatively narrow channel leading from outer to inner bay. The Spanish gunboat Sandoval was based at Caimanera on the inner bay, and a string of blockhouses defended the railroad to Guantánamo City, 14 mi (23 km) inland. The Cuban insurgents maintained coastal outposts from the mouth of the Yateras River, east of the bay, to a point 15 mi (24 km) west of Santiago, and were in undisputed possession of the western point at the entrance to the bay. The first successful U.S. foray against Guantánamo Bay occurred on 6 June, with the arrival of the light cruiser USS Marblehead, captained by Commander Bowman H. McCalla, and the auxiliary cruisers USS St. Louis and Yankee, commanded by Willard H. Brownson. Commander McCalla had been detached by Admiral Sampson from the blockading fleet at Santiago and ordered to reconnoiter the bay for a naval base. The captain of St. Louis was to cut the cables which had their terminus in a small station on Fisherman's Point, and connected Cuba with Haiti and the outside world. On a previous occasion, St. Louis, on a similar mission, had been driven from the bay by the Spanish gunboat Sandoval. 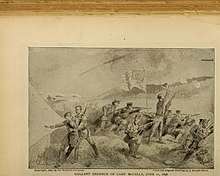 This time, as the three warships came into the bay at dawn, Spanish soldiers clustered about the blockhouse on the hill known today as McCalla Hill. The blockhouse and the village were speedily cleared by fire from Marblehead's six-pounder gun, along with a single 5 in (130 mm) shell. The Spanish gunboats Alvarado and Sandoval came down the channel from Caimanera to meet the attack but retired precipitately on discovering the caliber of guns against them. The one cannon of the fort on Cayo del Toro opened fire on Marblehead without effect until it was silenced. The telegraph cables leading east to Cap-Haïtien, west to Santiago, and the small cable in the bay connecting Caimanera and Guantánamo City with Cap-Haïtien were all successfully cut, and from 7 June to 5 July the town of Guantánamo had no communication with the outside world. Upon returning to the blockading fleet from the reconnaissance, Marblehead carried two Cuban officers who had been brought off to the ship from Leeward Point (the western side) of Guantánamo Bay. They had been sent to Admiral Sampson by General Calixto García (the same who figured with U.S. Lieutenant Rowan in the famous "A Message to Garcia") to report that the Cuban forces, whose outposts occupied positions on the coast from the mouth of the Yateras to a point 15 mi (24 km) west of Santiago were at the disposition of the U.S. Commander-in-Chief. Commander McCalla thereafter maintained close liaison with General Pedro Pérez, commanding the Cuban forces around Guantánamo City, through the latter's Chief of Staff, Colonel Vieta, and thus received valuable advice and assistance. With the decision to establish a base at Guantánamo Bay, the First Battalion of Marines, consisting of six companies of around 650 men (four infantry and one artillery company), was ordered to proceed in the converted transport USS Panther, and join the fleet off Santiago. The First Battalion, under the command of Lt. Col. Robert W. Huntington USMC, had been undergoing battalion exercises while awaiting orders at Key West. The Panther reached Santiago on 9 June 1898. That same day, in advance of the battalion landing, Navy Commander Bowman H. McCalla of the USS Marblehead, the officer in command of the landings, approved a camp site selected for the Marines by Lt. Col. Huntington. The site selected was a flat ridge on top of a hill, above the village on Fisherman's Point, and designated Camp McCalla. In addition to an artillery company equipped with a battery of four 3-inch rapid-firing artillery pieces and a Model 1895 Colt–Browning machine gun, each marine was equipped with the Navy's new rapid-firing magazine rifle, the Model 1895 Lee Navy. Both the Colt machine gun and the Lee rifles used a new high-velocity smokeless powder cartridge, the 6 mm Lee Navy. The Marine battalion landed unopposed on 10 June with five of its six companies, leaving the artillery company aboard to unload the ship, as Commander Reiter, the captain of the Panther, had refused to authorize the use of ship's personnel for unloading duties. Reiter also refused to permit the unloading of the remainder of the Marines' small arms ammunition, claiming that it was needed as ship's ballast. Lt. Col. Huntington sought assistance from Commander McCalla, who ordered Reiter to release the Marines' ammunition at once: "Sir, break out immediately and land with the crew of the Panther, 50,000 rounds of 6-mm. ammunition," McCalla ordered. "In the future, do not require Colonel Huntington to break out or land his stores with members of his command. Use your own officers and men for this purpose, and supply the Commanding Officer of Marines promptly with anything he may desire." Laborde reported the major Spanish force in the area had its headquarters at the "Well of Cuzco", 2 mi (3.2 km) southeast of Fisherman's Point. The well provided the only fresh water in the area. This occupying force of about 500 soldiers and guerrillas, joined by the troops driven from the blockhouse on the bay, constituted the gravest threat to the U.S. base of operations. Laborde noted that seizing Cuzco Well and destroying it would inevitably force Spanish forces to retreat all the way to Ciudad Guantánamo (Guantánamo City). This was the beginning of what Huntington's executive officer, Major Henry Clay Cochrane, later called "its 100 hours of fighting". At Camp McCalla, the Marines dug in and began firing at the concealed Spaniards, aided by three 3-inch field pieces and two additional 6 mm Colt–Browning machine guns which had been landed on 12 June by the USS Texas. Gunfire from Marblehead passed overhead and impacted in the nearby hills. Wearing large palm leaves tied to their uniforms for camouflage, and firing smokeless powder cartridges, the Spanish forces were difficult to locate as they moved from bush to bush in the dense undergrowth. On the evening of 12 June, enemy forces came within fifty yards of Camp McCalla, and a desperate firefight began. Marines responded with their Lee straight-pull rifles, along with machine gun and artillery fire from the Marine 3-inch field pieces. Perhaps deterred by the intense artillery and machine gun fire, the Spanish did not attempt to overrun the camp. Acting Assistant Surgeon John Blair Gibbs and Sergeant Charles H. Smith were both killed in this exchange of fire. Marines later found several blood trails, but no bodies, as the guerrillas removed their wounded and dead to conceal their casualty figures. Lt Col. Thomas of the Cuban rebel forces advised Colonel Huntington to attack the Spanish garrison at Cuzco Well, consisting of four companies of Spanish infantry and two companies of loyalist guerrilla forces totaling some 500 men. By capturing and destroying the only nearby source of fresh water, it was hoped that the defending Spanish forces would be forced to leave the area. Commander McCalla approved the plans, and the attack was scheduled for 08:00 the next day. Marine companies C and D, about 160 men, under Captain George F. Elliott, a future Commandant of the Marine Corps, joined by the fifty Cubans under Lt. Col. Thomas, would approach Cuzco along the cliffs by the sea. A smaller Marine force would advance by an inland valley, holding a picket line for the main force, with men in reserve to assist if necessary. The gunboat USS Dolphin was assigned to support the attack from sea. The light weight of the Marines' new 6mm Lee cartridge proved to be of considerable benefit, allowing each Marine and machine gun crew to transport large amounts of ammunition over the mountainous, jungled terrain. Midway through the battle, the Cuban rebel forces ran out of 6 mm cartridges, and were resupplied with an additional six clips (30 cartridges) from the belts of individual Marines, yet none of the Americans ran short of ammunition, despite firing some sixty shots apiece in the battle. Meanwhile, attention was soon focused on other areas of the bay. The Spanish were adding to their earthworks on Cayo del Toro, where they had three bronze 6.4 in (160 mm) guns and a modern 3.5 in (89 mm) Krupp gun. At Caimanera, on the bluff south of the village, were mounted three more of the 6.4 in (160 mm) guns, and the small gunboat Sandoval had a battery of one six-pounder and an automatic one-pounder Maxim gun. The 7,000 Spanish troops at the city of Guantánamo — only 40 mi (64 km) away — did not march to the aid of Linares' besieged army, because prior to the cutting of his communications, General Pareja had been directed by his superiors to hold the city of Guantánamo at all costs. This was so ordered because the Spanish feared that the Guantánamo valley might be used as an invasion route by U.S. forces, as the English had once used it to advance on Santiago. After the Navy cut the cables and established a base at Guantánamo Bay, General Pareja remained in complete ignorance concerning the course of the war because the Cuban insurgents maintained such a tight ring about the city that not one messenger got through their lines. Fifteen were caught and executed as spies. None of General Linares' frantic requests for aid reached Pareja. The threat posed by U.S. Naval forces and a battalion of Marines at Guantánamo Bay, plus the stranglehold on land communications by 1,000 Cuban insurgents, effectively pinned down an army of 7,000 men which might have changed the outcome of the fighting at Santiago. 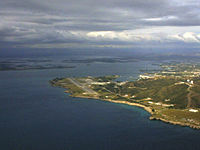 Less than a week after the surrender of Santiago, the base at Guantánamo Bay was used to launch the invasion of Puerto Rico, 500 mi (800 km) to the east. Three thousand five hundred troops under General Miles sailed from the Bay on 21 July. This was the last important event in the Spanish–American War phase of Guantánamo Bay; on August 12, the war ended with the signing of the peace protocol and an armistice. The new U.S. Naval Base was not formalized by lease agreement between the U.S. and Cuba until five years later, when in 1903 it was acquired as a "coaling and Naval station", but its worth was already proven. Lt. Col. Huntington's Marine First Battalion, which had reembarked aboard the USS Resolute during the siege and surrender of Santiago, sailed for the United States, and after a stop at New York, arrived at Portsmouth Harbor, disembarking her marines on the evening of 24 August 1898. ^ Venzon, Anne, General Smedley Darlington Butler: Letters of a Leatherneck 1898–1931, Greenwood Publishing Co, (1992), ISBN 0-275-94141-8, p. 8: The USS Texas landed three 3-inch (75 mm) field pieces and two additional M1895 Colt–Browning machine guns on June 12, the latter procured from the ship's own armory. ^ Clifford, John H., History of The First Battalion of US Marines (1930), Box 15, Cochrane Collection (PC# 1), Marine Corps Historical Center (MCHC), Washington, D.C..
^ Sage, William H. (Maj.), and Clark, H.C. (Capt.) (ed. ), Journal of the United States Infantry Association, Washington, D.C.: United States Infantry Association, Vol. IV, No. 4 (January 1908), p. 520: 220 6 mm Lee Navy cartridges weighed approximately the same as 160 cartridges in .30 Army caliber. ^ Converse, George A. (Commander) et al, Annual Report to the Secretary of the Navy: Report of Naval Small Arms Board, May 15, 1895, Washington, D.C.: United States Navy Dept. (1895), p. 309: The basic combat ammunition load of an 1898 naval bluejacket or marine was 160 rounds of 6mm ammunition, carried in four lightweight cartridge boxes attached to the belt. Outfitted in this manner, a marine could carry 60–100% more rifle ammunition on his person than the typical Army trooper. ^ Keeler, Frank, p. 16: "We were ordered to fill our belts and canteens..."
Wikimedia Commons has media related to Battle of Guantánamo Bay. This page was last edited on 2 March 2019, at 23:38 (UTC).